Chapter of Excellence Awards, Winter Gatherings, Unite Walk Wrap-Up and More! Virginia Hemophilia Foundation (VHF) was honored to receive FIVE NHF Chapter of Excellence Awards at the NHF Annual Bleeding Disorder Conference this past October in Orlando, FL. NHF will honor these achievements in numerous ways, including financial sponsorships and cash awards, recognition on the NHF Website, and acknowledgement in an upcoming Hemaware Magazine. We are thrilled about VHF’s success and appreciate your support in helping VHF excel in five out of six possible categories! Advocacy & Public Policy Chapter of Excellence Award in recognition of our commitment to advocacy and education initiatives both at the state and local level, aimed at improving the lives of those in the bleeding disorders community. Board Governance & Leadership Chapter of Excellence Award in recognition of our organization’s commitment to building strong, engaged, mission-focused leadership, paving the way for our tomorrow and helping us improve the lives of those in the bleeding disorders community. Fundraising & Development Chapter of Excellence Award in recognition of our organization’s commitment to financial health—ensuring our strength in providing families with access to care, resources, and education—and the sustainability to do so. Partnership Chapter of Excellence Award in recognition of our participation in shared initiatives, trainings, and programs of NHF. We are committed to the relevance and vitality of our national chapter network as we work together to improve the lives of the bleeding disorders community nationwide. Programs & Services Chapter of Excellence Award in recognition of our organization’s commitment to serving individuals affected by bleeding disorders through education, community, care, and connection. Giving Tuesday is November 27th: Give Where You Live! We can’t believe we only need $3,403 to reach our stretch goal of $50,000 for the Unite for Bleeding Disorders Walk! Once we meet our goal we will nearly DOUBLE our impact on programs like camp and scholarships from last year - and it’s all thanks to you! We know many of you have given a lot for the Unite Walk, and we are so grateful to you. If you haven’t supported the walk yet, or simply didn’t meet your fundraising goal, we would like for you to help us reach our stretch goal of $50,000 by donating to VHF this Giving Tuesday! When you donate please share the Unite Walk webpage: www.uniteforbleedingdisorers.org/event/rva with your social media networks along with a selfie or video and use the hashtags #givewhereyoulive #givingtuesday. $3,403 - think of how much that money could do for our community in the coming year. $600 will send one child to Camp Youngblood. $250 provides one family emergency assistance. $100 supports a family’s attendance to our annual education meeting. $50 will pay for a lifesaving Medic-Alert tag. There is no amount too small or too large - we would simply love your help reaching our goal and raising $50,000 for our Unite Walk this Giving Tuesday, November 27th. GO HERE TO DONATE ON GIVING TUESDAY! Almost a dozen teens gathered together the first weekend in October at Camp Holiday Trails in Charlottesville. 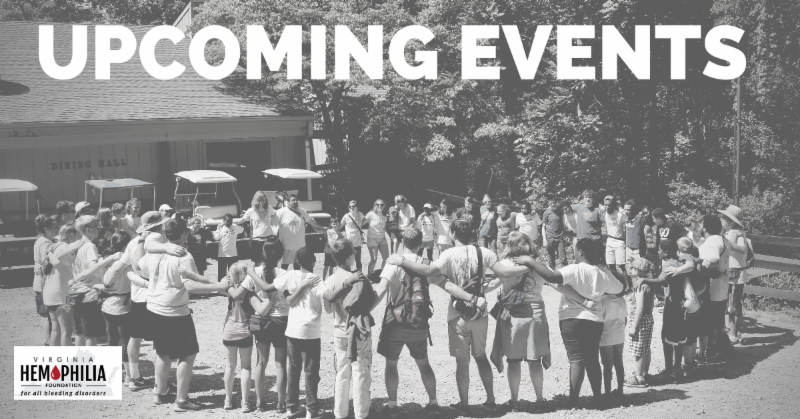 This annual event is a chance for teens to connect and create a strong sense of community! 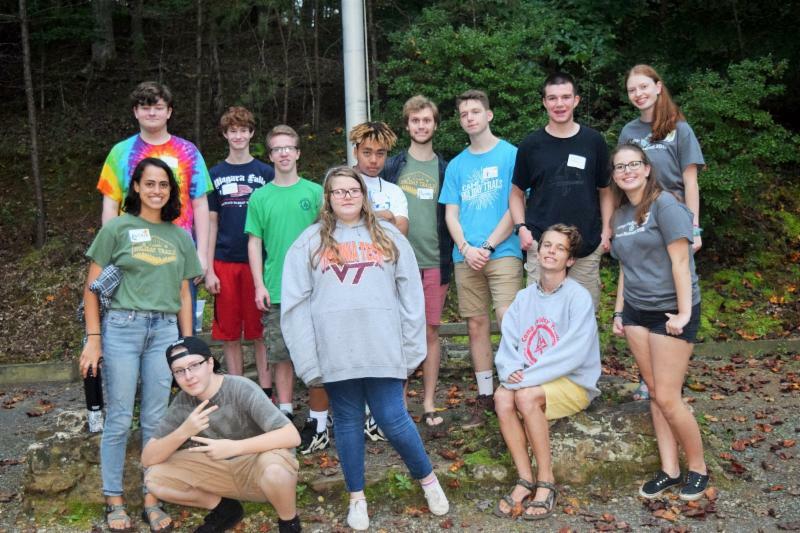 This retreat is for ages 13 to 17 with inherited bleeding disorders, their siblings, and teens of members of the Virginia inherited bleeding disorder community (in partnership with the Hemophilia Association of the Capital Area (HACA). Throughout the weekend the teens were treated to a variety of education and physical fitness sessions with plenty of time for traditional camp activities. A highlight of the retreat was a learning and jam session with JMUke, a community-based music group run by music education students from James Madison University (JMU) where they lead groups in ukulele education. Thank you to our sponsors Bioverativ, Genentech, Hemophilia Federation of America, Novo Nordisk, and Shire. Go here to see event photos. In October, I attended the NHF Annual Bleeding Disorder Conference in Orlando, Florida. I had an amazing time and was able to take part in a variety of programs. The program track that I most enjoyed and benefited from was the rare bleeding disorders track. These sessions provided me with valuable information and resources to assist me in living with a rare bleeding disorder. There was a session that specifically discussed the basics of my bleeding disorder. This was great because I was finally able to understand my specific bleeding disorder, including the science behind it and the various ways it can affect me now and in the future. I also got to hear about the changes and progress being made for the rare bleeding disorders community. I talked to a hematologist who is working to bring factor products into the United States for my bleeding disorder, as currently there is no factor product available to me. It gave me hope to know that one day, myself and others could have access to this form of treatment. I also enjoyed connecting with others with rare bleeding disorders, sharing our experiences with each other, and learning from each other. I also attended many great sessions on topics such as women with bleeding disorders, mental health, and transitioning into adulthood. In addition to the educational sessions, there was many other great events. There were events both Friday and Saturday night that had lots of fun activities for all ages, including mini golf, a stuffed animal workshop, photo booths, and a live band. The exhibit hall also provided a variety of activities including face painting, caricatures, and games. The thing that I most enjoyed about the exhibit hall was networking with the many people there. I was able to get to know numerous, wonderful people and hear about the work they were doing in the bleeding disorders community, as well as learn about a variety of available resources. This also gave me the chance to teach people about my bleeding disorder and advocate for myself. Attending the conference was a wonderful experience! Thank you so much to VHF for this incredible opportunity! Go here to see event photos. On Thursday, October 18th a group of eight families gathered in Hampton, VA for a delicious dinner at local restaurant, The Grey Goose, and the talk focused on how DNA works. Sue Cowell, Community Relations Manager at Bioverativ, led a discussion on the basics of DNA, including the ways it makes us unique, where it resides in our bodies, how it can affect our health, and the relationship between DNA and hemophilia. Thank you to Bioverativ for sponsoring this informative talk and thank you to volunteer and program committee chair, Amy Walker, for being in attendance and representing VHF at this event! Sunday, October 28th was a special day as we celebrated our fundraising success over the past six months and united together as a bleeding disorders community for our inaugural Unite for Bleeding Disorders Walk - Richmond! Our original goal was $35,000, and along with our sponsors you raised $46,597 - awesome job! Thank you so much to the Krecek family and Krecek Kakes for donating much-appreciated coffee and sweet treats to all our participants, and the VCU Cheerleaders for donating their time and bringing joy and pep to our step on a chilly fall morning! Participants also enjoyed entertainment from Nutzy mascot for the Richmond Flying Squirrels and Jonathan the Juggler! Thanks to our incredible team of event day volunteers for bringing everything together. Check out our event pics here! On the fundraising side…WOW! We have to give a huge shout out to our Top Team, Team Star City Bleeders, who raised $2,331 BEFORE the Unite for Bleeding Disorders Walk! Also, what an amazing job from our number 2 and number 3 teams, Team Steve and Team O'Connors, who raised $2,030 and $1,374 before the walk, respectively. Our Top individual fundraiser was Steve Spasojevich, with an incredible $2,030 raised, followed by Kevin O'Connor with $1,169 and Marquita Reinhardt at $676.00!! Altogether, our amazing teams and individuals raised $13,112! We cannot forget our local event sponsors, without which this event would not have happened. Thank you to Bioverativ, CSL Behring, NovoNordisk, Shire, Genentech, Pfizer, Accredo, Aptevo Therapeutics, Factor One Source/Fast Pharmacy, Matrix Health Group, SunTrust, Strategy Café, and Superior Biologics! 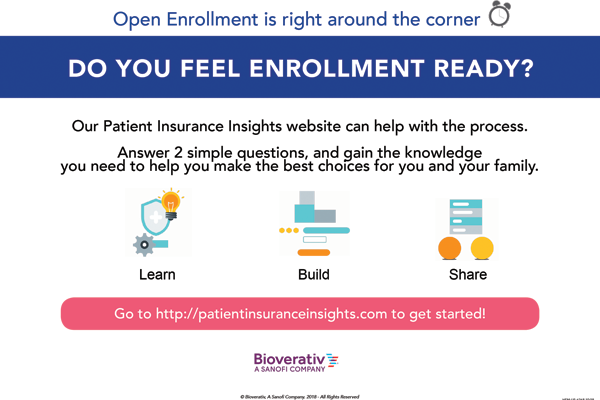 The Open Enrollment Period is the time each year when health insurance plans are required by law to accept applications from new plan enrollees regardless of their health history. This also is the time when you can choose to stay with your existing health plan. Employer Provided Coverage: If you have an insurance plan through your employer it is also important during this time to weigh the coverage that the employer-sponsored health insurance provides against that available in the Marketplace or Medicaid before deceiding on your coverage. Go here to learn more from HFA about how to navigate employer provided coverage. New This Year - Medicaid Coverage: There are also new rules for Virginia’s Medicaid program that may affect your 2019 Marketplace coverage! Beginning on January 1, 2019, Virginia’s Medicaid health insurance will have a new option for adults. This means that some adults who qualified for financial assistance to purchase a 2018 Marketplace plan may now qualify for full-benefit Medicaid coverage. You can find more information for Marketplace enrollees newly eligible for Medicaid here and more about the new Medicaid coverage option for adults here.